their hair, like many other things they do now, is using Masked materials with fuzzy alpha that gets corrected with TemporalAA. but if you don't like TemporalAA or just can't use it (for example a project with fast moving objects, where TemporalAA is very glitchy) then you'll be getting dither patterns which are ugly as hell (something like this, but just static). but going back to a non fully functional Translucent mode is also bad. Alternative for hair is per pixel linked list and sorting. AMD has TressFX and Nvidia has Hairworks for this. Both look really cool but are pretty slow. Transparency isn't solved problem. Is there a reason that previews are now being pushed to the Release branch on Github? According to the readme, it says that Release is supposed to be the most stable releases, and obviously Previews aren't stable. This is really mucking with workflow as we are basing our engine branch off of Release, and we don't want to move to 4.11 until it's stable. It's not as much of an issue now as 4.10 branch doesn't have any unreleased changes, but it did a few weeks ago. This is a mistake that we are working to fix. Our apologies for the inconvenience. Currently we suggest you sync by Tag instead of by Branch. 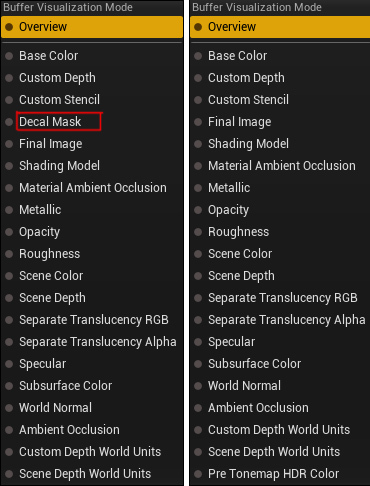 Is there any reason for removing "decal mask" from Buffer Visualization Mode? I used it quite often in previous version of the UE. UE4 blog: www.michalorzelek.com/blog/ - Tutorials, free content and more! This pull request is still under review. Unfortunately we have already passed feature lock for 4.11, so it is unlikely that any more pull requests will make it into 4.11 unless they are absolutely critical. thanks for the answer i made a check with the guy who fixed the lan android issue in the above pull request and he told me that the wifi lan in android is still not officially supported and its not a bug in the engine so to get this feature we need to ask epic team to add it to the engine so can you tell me if there are a specific form that i can request feature of lan wifi to be supported in android by the engine so we can make a project of Co Op games in android without need of external wifi router ? More info on this please? Can I use this with my own non unreal server? Fetch.. observe.. decide to merge or not.. I don't known why or what i do if do something but my "ThirdPersonCharacter" mesh in my testing 4.11 project disappears. Nothing dramatic, i select again the Skeletal Mesh and the Anim Class and its fine again. Last edited by knack; 01-21-2016, 07:02 AM. Is GLES 3.x available out of the box (without a need to recompile engine) ? Is Oculus Mobile/Audio SDK 1.x already made it into preview 3 ? I had 4.11P1 installed here and then later uninstalled. Now I want to install P3. The launcher offered me "update" although I did uninstall 4.11 before. After that upgrade process, the whole 4.11 is gone from the launcher and it doesn't offer me to install it again, I can't access it at all. I deleted the 4.11 folder but same result. What can I do to get it to show in the launcher again? Last edited by Wallenstein; 01-22-2016, 01:52 AM. This issue has been in since 4.8 and still isn't fixed. Material Graph doesn't refresh properly. To me the major issue about UE4 Editors is the memory, my pc has 16GB, when i open my project the editor shows "Mem: 1.038 mb", 15 min later after a few changes (like copy/pastes) it reaches ~"12.000 mb" and starts frozzen. So i need to restart editor everytime it is near 12.000mb, it is so annoying. I think it is maybe because the number of objects you store in memory so the user can make "undos" e "redos"
Hey, great work. Any reason my builds aren't running? If I double click on my exe I get nothing at all! Any command lines or whatever to encourage things? Have you compiled with VS2015? If you need in-depth assistance in getting up-and-running, please make a post on the UE4 Answerhub in the Installation & Setup section. I had a similar issue, make sure your antivirus isn't blocking any UE4 processes from running. I had to uninstall Avast to let my projects run. I'm fine with building my projects in VS2015 - My projects don't contain any custom source (they're source projects though), but they contain plugins which have compiled fine for v4.11 and my projects have converted to 4.11 fine. My problem is when I choose any of the build modes and create my shipping or develop versions. In my windows no editor folder the exe is sitting there but won't run or even do anything when I click. My Plugins are the UE4_OSC plugin and Rama's Victory plugin with all of the functions I don't need/won't compile commented out. (They work fine in the editor and If I run the standalone game mode it works too).